A review of The Lost World of Byzantium by Jonathan Harris is near impossible to write. The issue is the breadth and sheer extent of its topic, an issue the author confronts with both enthusiasm and endurance. And it is often a problem of which we’re unaware, precisely because we are rarely conscious of the assumptions we bring to any experience. And this is precisely why we need books like this one by Jonathan Harris, because it can cut through what we clearly don’t understand. We need to face preconceptions, because the process is always enlightening. However, the process is often hard as well. We talk a lot of Rome, and even less of Byzantium. We hail the achievements of the former, and generally list the shortcomings of the latter. We see Rome as somehow noble, classical and correct, whereas Byzantium is often corrupt, degenerate, knavish and unsuccessful. And, as Jonathan Harris points out, we’re always describing why the Byzantine Empire eventually failed. What we rarely acknowledge is that at its height it was a broader empire than Rome’s and, importantly, it actually lasted longer than its precursor. And it was Christian from the beginning. It is this perception of Byzantium as ultimate collapse that Jonathan Harris dispels at the beginning. Additionally it is essential that he does this, since then we could appreciate the detail of the empire’s history in its own context, instead of in a different imposed by our own preconceptions about a future it never saw. The Ottoman expansion westwards and its eventual conquest of the empire functioned to provide a wake-up call for concerted action to defend Christianity. The fall of Byzantium, however, rendered any future sectional gain irrelevant, for if the edifice fell, there would be nothing for anybody. And thus the continent changed a little after Lepanto. Any reader of such a long and complicated history as that of the Byzantine Empire, however, must keep in mind the size and scope of the author’s task. The Lost World of Byzantium may comprise about 150,000 words, but it is hoping to pay more than a century of European history, not to mention swathes and eras of Middle Eastern, Central Asian and North African history also. We soon learn not to regard the Byzantine Empire as a purely or even primarily European phenomenon, as regular battles are fought to the south and east as well as to the north and west. What’s clearer, however, is an empire may wage war in its periphery, which war may lead to expansion or contraction of its land. But if the empire wages war against itself in the centre, then the danger to its security is existential. Jonathan Harris’s book relates several occasions when Byzantium endured such complete and wounding internecine transformations. An enduring insight from The Lost World of Byzantium relates to this overall function of religion in these transfers of power, and specifically the capability of theology to create empires, rulers, dynasties and possibly states. 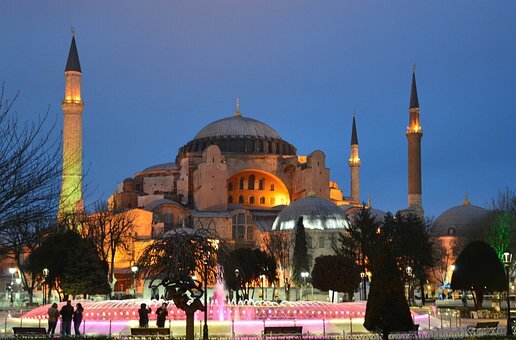 Byzantium was founded on Constantine’s embracing of Christianity. However, this was only the beginning of the story as we perceive it. The ancient church was riven by schisms and heresies, notably the Arian interpretation of the nature of Christ. From the perspective of our own age, these theological differences might appear to have the significance of disagreements on the exact count of angels on a pinhead. But at the moment, theological disagreements could lead to persecution, exile and war. A long time after the early church had solved some of its self-generated conundrums, new theological differences emerged with similar consequences. It’s an excellent accomplishment of Harris’s book that it manages to increase what we now might regard as arcane to the status of living political argument. If economic advantage granted by the accomplishment and tenure of power, as ever, remained the target, the political and ideological battleground where that status was secured was frequently theological and only when we appreciate that role do we understand the history of the empire, and perhaps also the history of the earliest and much of the second millennium of the Christian era. If there’s a criticism of this monumental work, it’s that the necessity of chronicling the incumbents of the throne sometimes make the history a mere list of tenants, a procession of kings who only seem to come and go. The Johns, the Michaels and the Constantines keep coming, forever counting, and it seems sometimes that only the figures change, as every freshman suffers his own conspiratorial destiny, often remarkably similar to that of his predecessor. There are numerous child emperors, all with their own nakedly ambitious protectors. And also history seems to reproduce itself as yet another incumbent marries to secure peace and alliance, or pursues yet another catalogued military campaign against north, south, east or west, as ever only partially successful. The muddle, it appears, tends to last. In general, the book deserves some criticism for not including enough description of the social and economic conditions within the empire. Such diversity, both ethnic and religious, needs more detail to provide a picture of its complexity. There’s not much that conveys any sense of what it was to live even in Constantinople, itself, let alone the Byzantine Empire as a whole. But then, with a job of this size, any author has to be selective. Jonathan Harris simply could not have included material of the kind without doubling the size of an already massive book. And, given the writer’s commitment and dedication to his subject, this absence needs to provoke many readers to explore more of his output. This facet surely has also been covered elsewhere. What’s included are descriptions of greens and blues, Pechenegs, Basils, various Phokases and numerous Theodoras, alongside Abbasids, Seljuks, Fatimids and hordes of Constantines. If even one of those hits a blind spot, then Jonathan Harris’s book will help provide the missing understanding. If anything, it is surely comprehensive. History is always about much more than our preconceptions and all good writing on the subject should remind us of this fact. The Lost World of Byzantium provides a superb opportunity to learn much about this neglected, but crucial age of history.